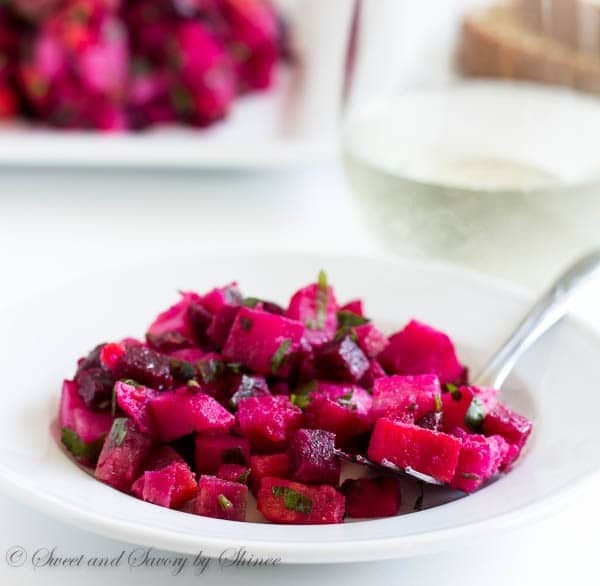 Classic Russian vinaigrette salad (Винегрет) with roasted beets, dressed in simple extra virgin olive oil. This vibrant root-vegeatble salad is a healthy comfort food, perfect all year round! 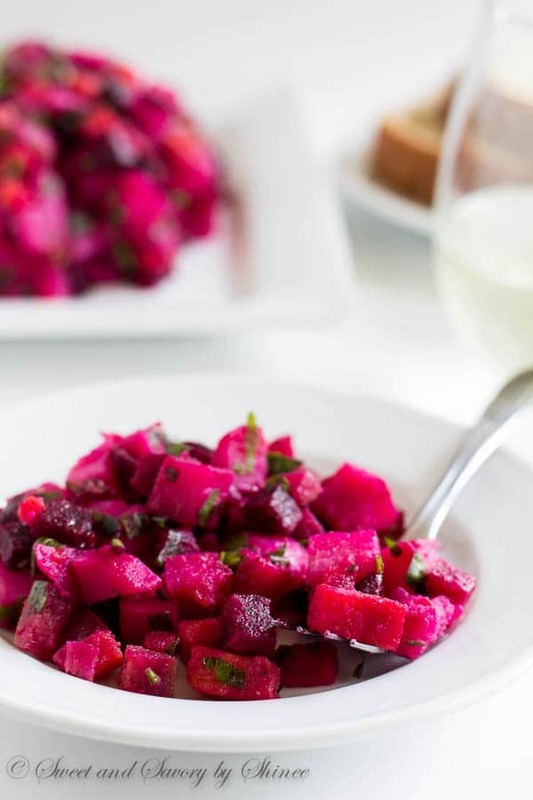 Anyway, since many of us love this beautiful ruby red root vegetable, I thought I’ll share another favorite salad from my childhood. It’s a classic Russian vinaigrette salad, that’s made of beets, potatoes, carrots, pickles, and sometimes sauerkraut. Loaded with fresh parsley and dressed with extra virgin olive oil, this root vegetable salad is healthy, delicious and absolutely gorgeous. This one is a staple in Russian cuisine! It might seem like time-consuming process to make this salad, but all the efforts are well worth it. The salad can be stored in the fridge for up to 5 days, and it gets better and better over time. Just like in my potato salad, I like to dice the potatoes and carrots before cooking. It’s easy and no-mess method. Oh here is a quick tip: to prevent the potato cubes from falling apart add a tiny bit of vinegar in the water. The potatoes come out perfectly in shape without getting mushy. Typically, this salad also includes sauerkraut, but I don’t put any in mine. The pickles add enough tang, plus the crunchy pickles add a nice texture. Hope you give this recipe a try. If you do, I’d love to hear your feedback. Cheers! 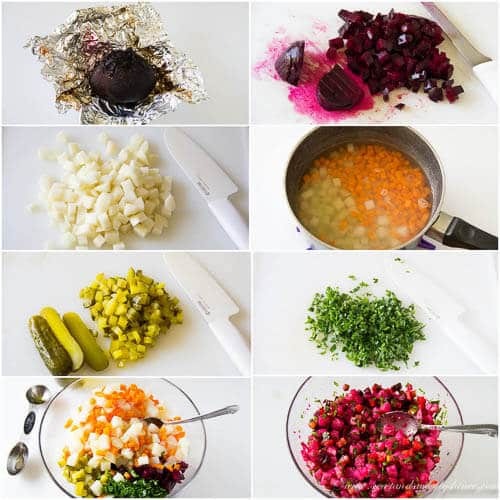 Wrap the beet in a foil and bake for about 45 minutes, or until fork tender. Once cooked, unwrap, cool until safe to handle and peel. Dice the roasted beet into small cubes. Cut the potatoes and carrot into small even cubes. In a large pot filled with water, add the cubed potatoes and carrots. Add vinegar and salt and bring it to a boil over medium high heat. Reduce the heat and gently boil until the potatoes are cooked through, about 15 minutes. Drain and cool to room temperature. Cut the pickles into small cubes. Chop the parsley. 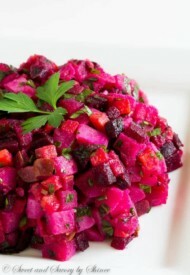 In a large bowl, combine cubed beets, potatoes, carrots, pickles, and parsley. Drizzle extra virgin olive oil and mix until well combined. Salt and pepper to taste.